If you want to get in touch with me, hit one of the buttons below. 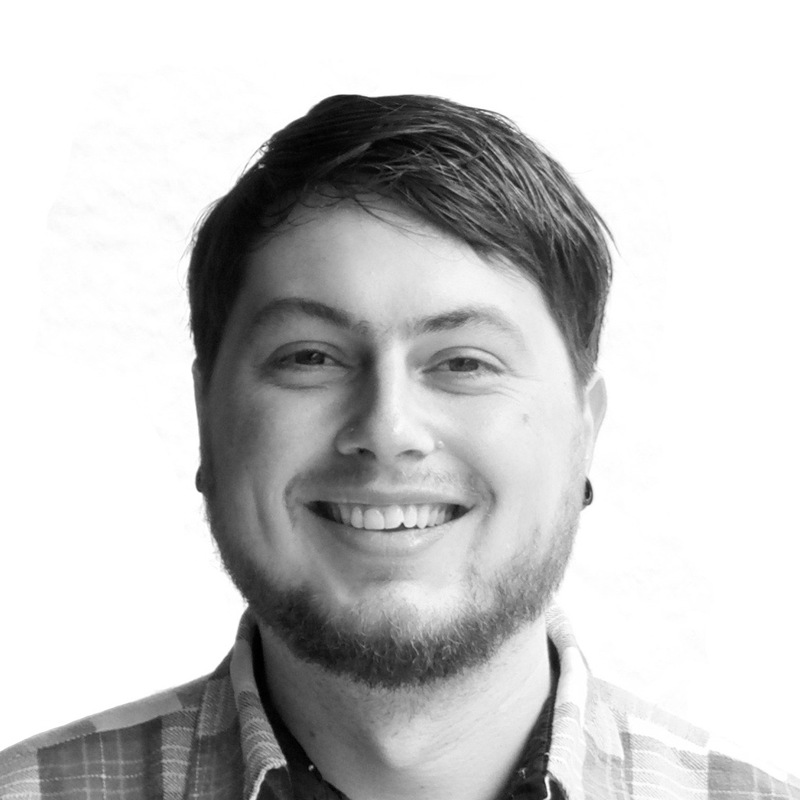 I am a Edinburgh-based translator, Icelandic language teacher and web designer. This is my CV, scroll down to find out more about me. 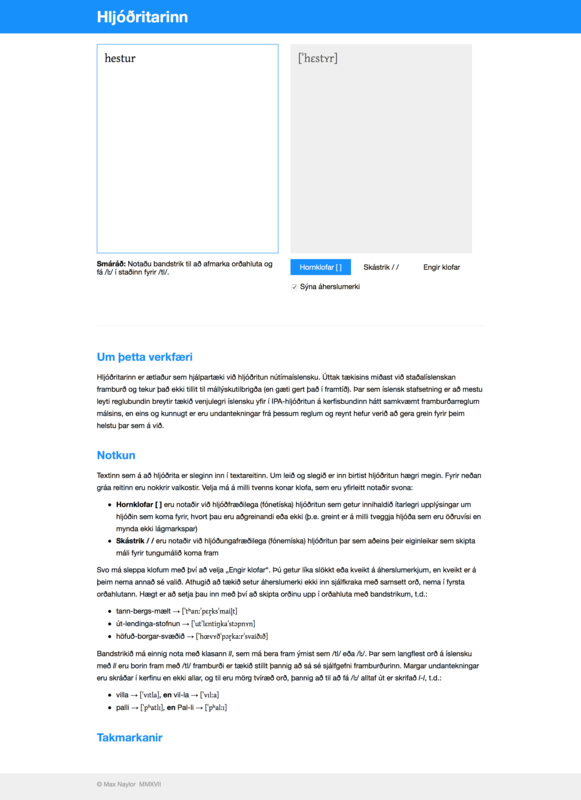 Check out my portfolio for samples of my web design and translation work. I’m currently a Nordic-to-English translator for a UK-based LSP and teaching fellow in Icelandic at the University of Edinburgh. Get in touch for more info. Since 2013, I have worked part-time on a freelance basis as a translator from the Scandinavian languages into English, with the main focus on Icelandic. »I have worked on a wide range of projects, everything from corporate handbooks to marriage certificates to promotional materials for art exhibitions. I have tutored learns at various levels, mostly beginners, in Icelandic. »I have taught one-on-one in person and remotely, providing my own teaching materials suitable for students with no background knowledge in the language. Find out more. In this role I oversaw the service and repair department of this local Icelandic Apple reseller. »My day-to-day responsibilities included performing repairs, communicating with customers, managing inventory and handling customer queries and complaints. On a broader level, I oversaw the direction of the service department, implementing changes to processes and policies in order to streamline the repair flow and improve the customer experience. In late 2012, I began working for Apple once again as a Family Room Specialist (iOS support technician). »Shortly after rejoining, I went full time and became promoted to Genius. This role included servicing customers directly and repairing Mac and iOS devices. I also served as a role model for other team members and became a source of technical knowledge and leadership. After returning from my year abroad in Iceland, I interned at student marketing company The Beans Group. »Responsibilities included producing online advertising materials for Studentbeans.com and redesigning internal company stationery. During my exchange year in Iceland, I worked at local Apple reseller Epli. »This job gave me the opportunity to improve my working knowledge of Icelandic and as such I was able to create sales solutions and provide technical support entirely in the language. I worked at Apple Lakeside in the role of Specialist until October 2008, when I transferred to the Regent Street store. »During this time I had a number of career experiences. 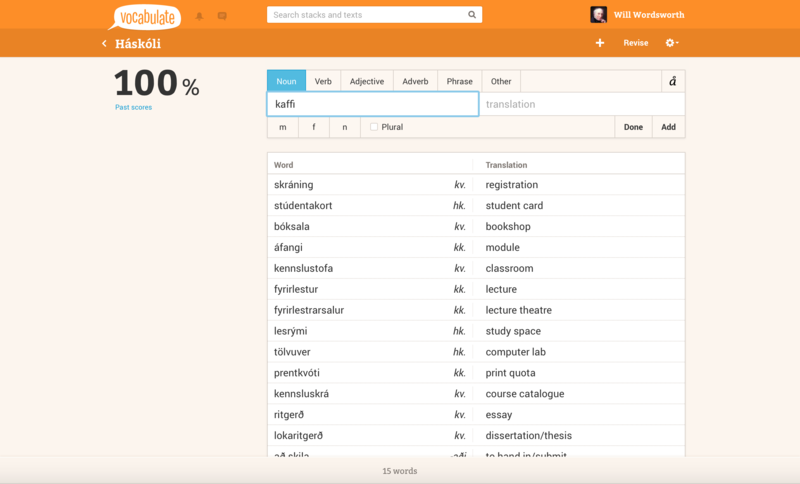 This project is a prototype of an intelligent personal assistant that speaks Icelandic. It was designed to show how it is possible to implement simple language processing techniques in order to respond to user queries. Input is text-based in this prototype, but it would be straightforward to integrate a STT system at a later point once such technologies have been developed. 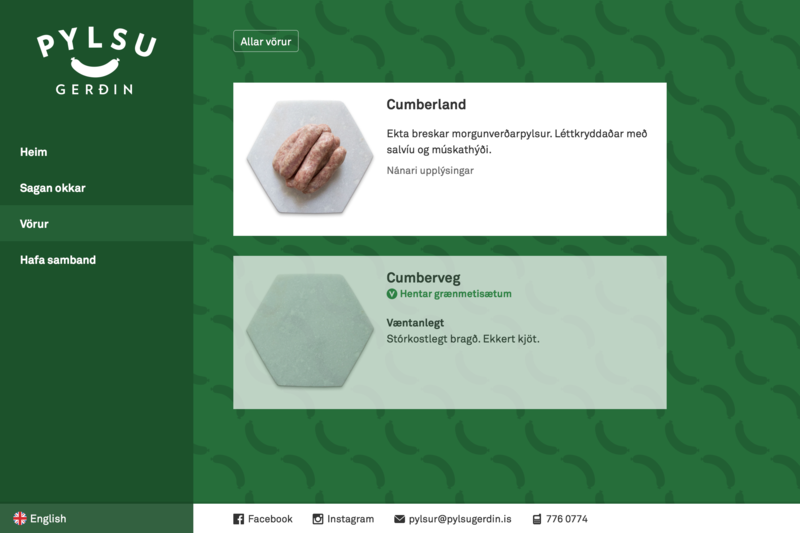 A simple but fun site was required to promote Pylsugerðin, a new brand of sausages in Iceland. The project encompassed a complete brand, including developing the logo and packaging. 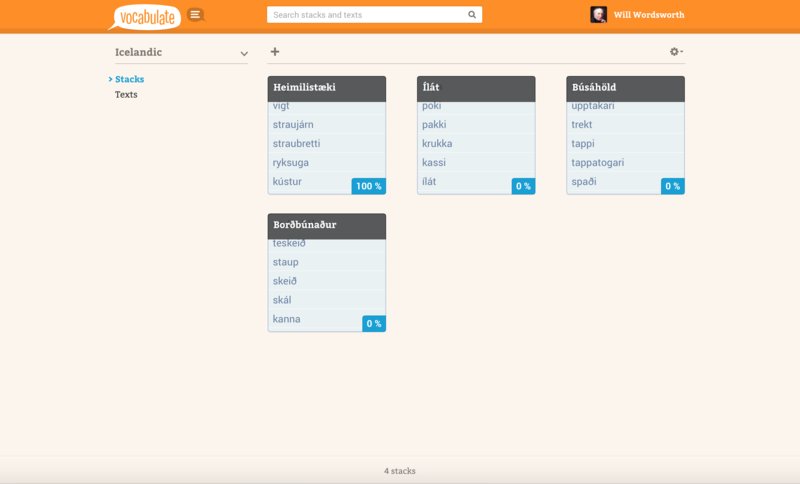 This is a simple web tool that provides rule-based IPA transcriptions of Icelandic words (work in progress). Hugsteypan’s Umgerð references the duo’s previous exhibitions, in which questions about the characteristics and values of artist’s works were posed. What physical and abstract qualities do artworks elicit, and what role does the context the piece is shown in have to play? Hugsteypan’s works tiptoe on the intersections of painting and photography, of discrete sculptures and holistic installations. Visual art is an unlikely tool, seemingly able to combine idiosyncrasies from all directions: a definition of the phenomenon itself is impossible to nail down. This precariousness is the driving force behind Hugsteypan. Findings often point in the same direction: that no matter what framework is employed, two people will never perceive and interpret the same object in exactly the same way. Although we usually assume that we say is heard and understood by others, one could argue that this is not the case at all. Interpretations of words and their context vary from one individual to the next. In Hugsteypan’s visual art, the audience is not necessarily required to fully comprehend the artists’ expressions, rather they are expected to recognise the gesture of the expressions and strive to absorb them. In its exhibition Umgerð, Hugsteypan sets out to explore visual art from their own point of view as artists, whilst simultaneously looking upon it through the eyes of the audience. The exhibition space is occupied by a 3D installation cascading across the walls and floors. It consists primarily of found materials that are of limited use ordinarily, but within the exhibition hall contribute to the overall effect having been taken out of their usual context. Photographs are similarly treated. They are not intended to stand as discrete reproductions of anything in particular; instead they serve as part of the abstract whole in which all is equal. The audience can walk about the exhibition space contemplating that which meets the eye. Infinite perspectives are possible. This is reflected in the installation’s metamorphosis as various images are projected across the room and the lighting transforms. Visitors are invited to direct their gaze in any direction they please, viewing from any angle, in this aesthetic experiment on perception. One must consider the question of the life of the artwork after the artist has it put it out into the open. What kind of images do different observers draw from the work, and what becomes of these images when they look away? Addressing this question directly, active visitor participation is combined with the experience of having seen the exhibition at Hafnarborg. Hugsteypan encourages all visitors so-equipped to take pictures of the installation, in whichever way the work inspires them to. If the images are shared online as per the instructions below, they will be projected into the exhibition space and subsequently become part of the installation. The question of the role of the author then surfaces: the audience is the author of its own pictures inspired by Hugsteypan’s work, which in turn influence it back. In some cases, the visitors’ pictures will be in a sense the only manifestation of the exhibition for the remote audience. Thus, a layered experience like of that of the phenomenon is born, where the proxy’s point of view is also heard. The tasks of contemporary artists tackling the uncertainty at the core of their works–which like the levels of complexity that lay before audience during their reading and interpretation–are all focussed on the same point. When all these factors are in free flow, the issue of whether this is worth all the effort arises. If the artist has no control over how an audience interprets a work (which may at the very least be misunderstood), then what is that pushes visual art forward? The answers to this question demarcate the grey areas of artistic creation today. The faith in the ability of artists and their audience to come together in a work and find something of substance is unyielding. That the artwork becomes some sort of junction or console through which the creative forces and the joy of creation flow. In order that this will continue to be possible, artists and the audience must acknowledge the value of playing the game that is visual art. It is folklore’s fjöregg, a token which brings trolls great joy as they toss it about amongst themselves, yet should it fall and break it will be their demise. Art only thrives because artists and their audience support it. Hugsteypan is now launching the fjöregg over to the audience, and it will be curious to see in what way people respond. Hugsteypan is the collaboration of the artists Ingunn Fjóla Ingþórsdóttir and Þórdís Jóhannesdóttir. They have worked together since 2008. The exhibition Umgerð has been adapted to Hafnarborg’s exhibition space, and was originally shown at Akureyri Art Museum – Ketilhús. Sýning Hugsteypunnar Umgerð kallast á við fyrri sýningar tvíeykisins þar sem settar eru fram vangaveltur um eiginleika og gildi verka sem listamenn skapa. Hvaða huglægu og efnislegu þættir móta listaverk og hvaða hlutverk leikur samhengið sem verkið er sett fram í? Verk Hugsteypunnar ramba á mörkum málverks og ljósmyndar eða stakstæðra skúlptúra og heildrænna innsetninga. Myndlist er ólíkindatól sem virðist geta innlimað eiginleika úr öllum áttum en skilgreining á fyrirbærinu sjálfu rennur manni þó stöðugt úr greipum. Þessi óvissa knýr áfram leit og leik Hugsteypunnar. 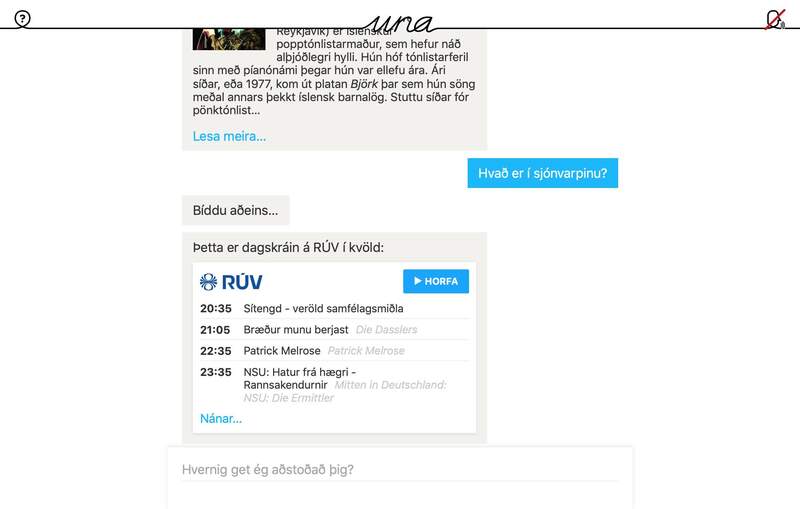 Niðurstöður benda einatt í sömu átt; að sama hvaða kerfi við notum þá munu tvær manneskjur aldrei skilja og skynja sama hlutinn á nákvæmlega sama máta. Þrátt fyrir að almennt sé gengið út frá því að það sem einn segir sé móttekið og skilið af öðrum, mætti færa rök fyrir því að svo sé alls ekki. Skilningur manna á orðum og samhengi er mismunandi frá einum einstaklingi til annars. 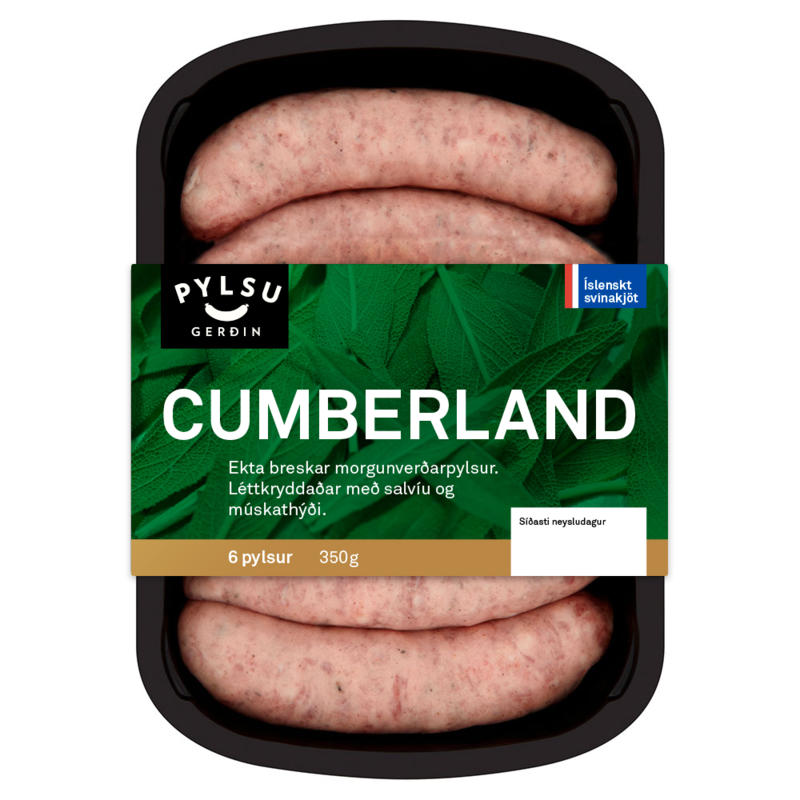 Í myndlist Hugsteypunnar er ekki endilega krafa uppi um að áhorfandinn skilji fyllilega það sem listamennirnir tjá, en þess vænst að hann beri kennsl á tilburði þeirra til tjáningar og leggi sitt af mörkum til þess að móttaka hana. Á sýningunni Umgerð einsetur Hugsteypan sér að skoða myndlist bæði frá eigin sjónarhóli sem listamanna en jafnframt með augum áhorfenda. Sýningarrýmið er undirlagt þrívíðri innsetningu sem teygir anga sína um veggi og gólf. Að miklu leyti er um fundin efni að ræða sem gegna alla jafna afmörkuðu hlutverki en innan sýningarsalarins eru þau tekin úr því samhengi og þjóna heildarmyndinni. Þar eru einnig ljósmyndir sem eru undir sömu sök seldar. Þeim er ekki ætlað að standa sem stakar eftirmyndirmyndir neins sérstaks heldur sem partur af hinni óhlutbundnu heild þar sem allt er lagt að jöfnu. Áhorfendur geta gengið um sýningarrýmið og virt fyrir sér það sem fyrir augu ber. Um ótal sjónarhorn að ræða og eins tekur innsetningin breytingum þar sem mismunandi myndum er varpað yfir salinn og lýsingin breytist. 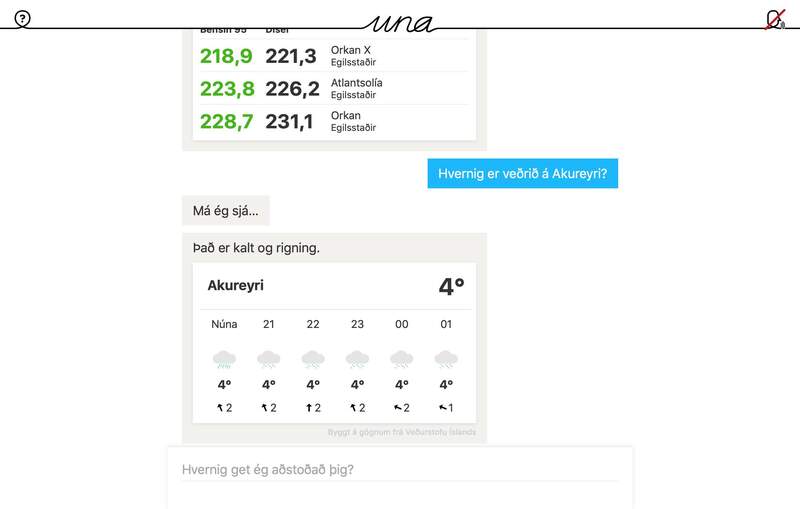 Gestum er boðið að beina sjónum hvert sem er og frá hvaða vinkli sem er í þessari fagurfræðilegu tilraun um skynjun. Til álita kemur spurningin um framhaldslíf listaverks þegar listamaður sleppir af því hendinni. Hvers konar myndir gera ólíkir áhorfendur sér af verkinu og hvað verður um þær þegar frá er horfið? Til þess að takast á við þessa pælingu bætist nú virk þátttaka sýningargesta við þá reynslu sem hlýst af því að njóta sýningarinnar í Hafnarborg. Hugsteypan hvetur alla sem eru til þess tækjum búnir að taka myndir í innsetningunni á hvern þann máta sem verkið blæs þeim í brjóst. 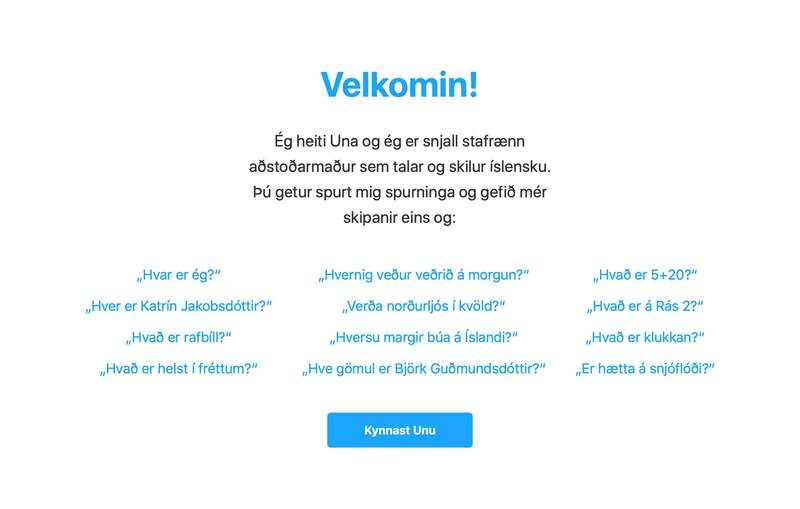 Sé myndunum deilt á netið eftir leiðbeiningum hér neðst á síðunni verður þeim jafnframt varpað inn í sýningarrýmið og þær verða þannig hluti af innsetningunni. Þetta vekur spurningar um höfundarhlutverkið; áhorfendur verða höfundar eigin mynda sem eru innblásnar af verki Hugsteypunnar og hafa áhrif á það um leið. Í sumum tilvikum verða myndir gestanna ef til vill eina birtingarmynd sýningarinnar gagnvart áhorfendum sem ekki sjá hana með eigin augum. Þannig verður til lagskipt upplifun eins og sama fyrirbærisins, þar sem afstaða milliliðarins hefur sitt að segja. Viðfangsefni samtímalistamanna sem takast á við óvissuna um kjarna verka sinna–sem og flækjustigin sem blasa við áhorfendum við lestur þeirra og túlkun–beinast öll í sömu átt. Þegar allir þessir þættir eru á reiki dúkkar upp spurningin um hvers virði þetta umstang sé yfir höfuð? Ef listamaður hefur enga stjórn á því hvernig áhorfandi móttekur verk (og þau kunni í besta falli að verða misskilin), hvað drífur þá myndlistina áfram? Svörin við því marka hið gráa svæði listsköpunar nú á dögum. Enn ríkir tiltrú á að listamenn og áhorfendur geti mæst í verkinu og uppskorið við það eitthvað sem skiptir máli. Að listaverkið verði eins konar millistykki eða fjöltengi sem sköpunarkraftur og sköpunargleði streyma um. Til þess að svo megi áfram vera þurfa listamenn og áhorfendur að gangast við því að myndlist sé leikur sem þess virði sé að leika. Hún er fjöreggið sem tröll í þjóðsögum kasta sín á milli og hafa af því mikla unun en brotni það verður það þeirra bani. Listin þrífst því aðeins að listamenn og áhorfendur haldi henni á lofti. 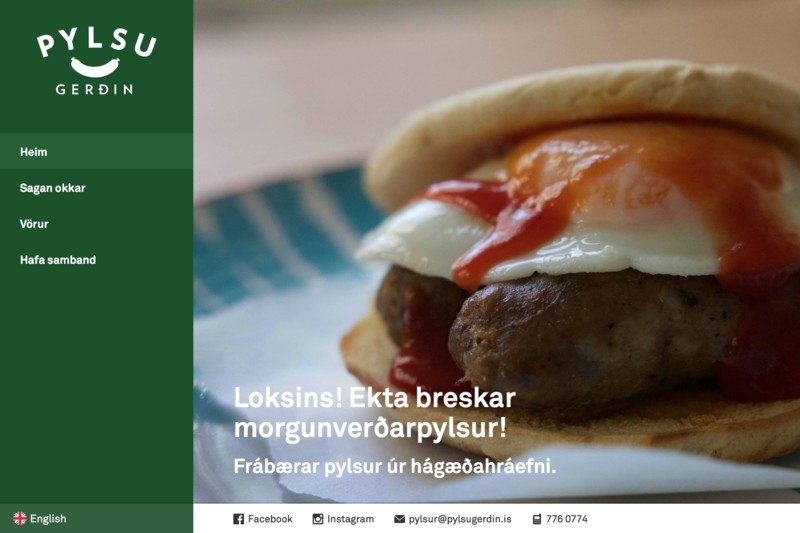 Hugsteypan kastar nú egginu til áhorfenda og forvitnilegt verður að sjá hverju þeir kunna að svara. Hugsteypan er samstarf listamannanna Ingunnar Fjólu Ingþórsdóttur og Þórdísar Jóhannesdóttur en þær hafa starfað saman frá árinu 2008. Sýningin Umgerð er aðlöguð að rými Hafnarborgar en var upphaflega sett upp í Listasafni Akureyrar – Ketilhúsi. Hafnarborg – The Hafnarfjörður Centre of Culture and Fine Art is an Icelandic art gallery and artist residence. I have translated various exhibition materials for this client, a sample of which is given here.